Treat your little cowgirl to her own pair of super-stylish (and super comfy) boots! These high-quality girls' square-toe boots are made with the same great craftsmanship as Mom's and Dad's, but in a smaller, more playful package for kids. Featuring a bold, two-tone design, the Crocodile Romp boots are crafted of genuine leather throughout, including the shaft, foot, interior lining and soles. The foot has a unique texture that mimics the appearance of crocodile skin. The shafts are available in your choice of Turquoise and Pink, which create a striking contrast to the brown leather. 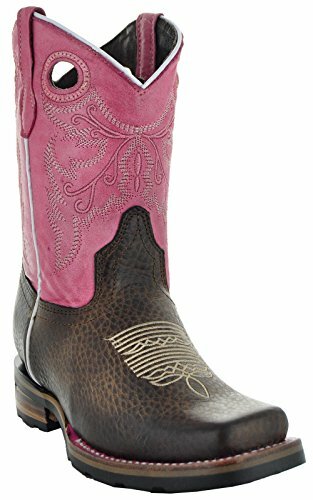 Classic Western patterns on the shaft and foot, as well as piping on the sides, add even more authentic detail. With cozy cushioned insoles, shock-absorbing soles and the smooth leather lining inside, her little feet are sure to stay cozy. She can wear them comfortably for virtually all of the activities that make up her day: school, play, errands with Mom, and so much more. Crafted by hand, these boots also feature slip-resistant soles to help keep her feet steady on slippery surfaces. Dual pull holes provide easy on and off, while also giving the boots a timeless profile.